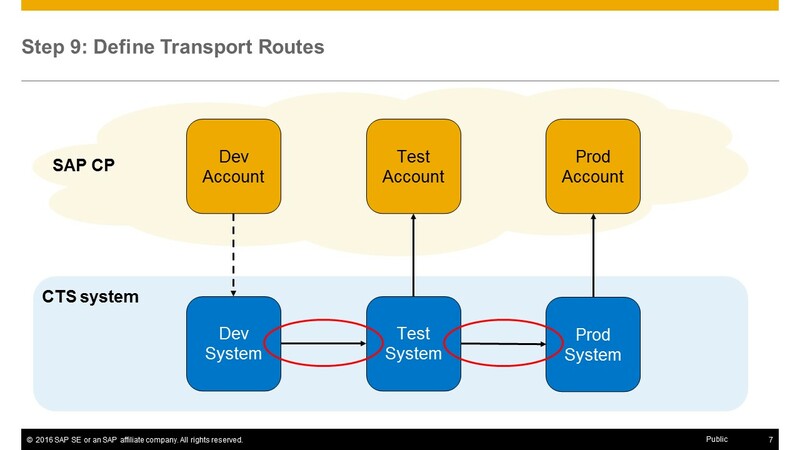 In this blog I will describe step by step how to set up a transport landscape in SAP Cloud Platform integrated with SAP’s enhanced Change and Transport System (CTS+). The procedure is derived from the very useful how-to guide ‘How To… Configure HCP for CTS’. I will reference the chapters of this guide in the blog and extend the explanations of the guide where needed. On top of that I created short video clips of each and every step of the setup. I will setup a three account (system) landscape with the account roles development, test and production. Enhanced CTS allows more complex landscapes as well, e.g. additional pre-production account, several production accounts, sandbox accounts, etc. The development content will be exported from the development account, attached to a transport request and added to the import queue of the test system. When the import to the test system is performed the development artifacts are deployed to the test account in SAP CP and the transport request is added to the import queue of the production system. On import the content is deployed to the production account. The account structure within your SAP CP global account strongly depends on requirements concerning security, isolation vs. dependencies of development projects, resource sharing vs. separation etc. Separate accounts e.g. allow individual configuration of integration to backend systems or of the used identity provider. Therefore you might require more than the three accounts I will be using here. This step refers to chapter 5.1 (‘Configuring an HTTP Destination’) in the How-To guide. Currently the CTS+ integration of SAP CP is based on loose coupling. That means that you have to export your development artifacts from your source (= development) account into a multi target application archive (MTAR) file on file system. How this is done in detail differs from development type to development type. Then from the CTS system you have to create a transport request (or use an existing one, which has not yet been released) and attach this archive file to the transport request. When you now release the transport request it is added to the import queue of the next target system(s), in my case the test system. 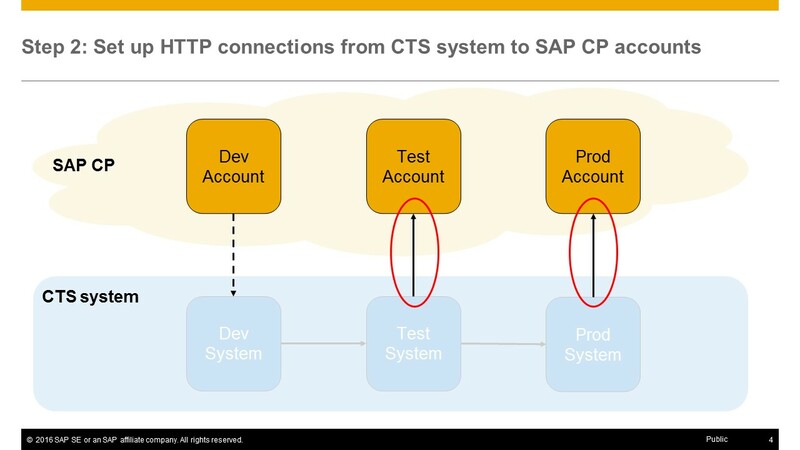 If you trigger the import into the target system the CTS system calls a service in the respective SAP CP account via an HTTP connection. Therefore I have to setup an HTTP connection for each and every target system (= account) in my landscape. In my example I need the connections for the test and the production system. I do not need a connection for the development account (therefore the dotted line in the target landscape picture). in the field RFC destination provide a name for the destination, e.g. ‘CAT_DESTINATION’ (I plan to name the representation of my test account CAT). Please observe that the name will be converted to upper case automatically. You will need the name of this destination later on. Please see the video on creating the HTTP connection to the test system. Repeat these steps for all your target accounts. In my example I have to do it for the production account (see video). This step refers to chapter 5.2 (‘Import SSL Certificate’) in the How-To guide. In order to establish an encrypted communication from the CTS system to the SAP CP accounts the CTS has to validate the server identity of the SAP CP server. This is done with the root certificate which has been used to sign the SAP CP server certificate. Therefore this root certificate has to be imported into the CTS system. You get the root certificate e.g. by exporting it from a browser (shown here for Internet Explorer) or by downloading it from https://www.digicert.com. The next step is to import the certificate into your central CTS system. Here is the video on the certificate import. I have also created a video for this check. This step refers to chapter 5.3 (‘Configuring the Transport Organizer Web UI’) in the How-To guide. The transport request used in the CTS+ integration of SAP CP are created and maintained with an ABAP Web Dynpro application, the Transport Organizer (Web UI). This application is made available via the Internet Connection Framework (ICF) and has to be activated when using CTS+ for the first time. If you already use CTS+ for other application types (besides SAP CP) you do not have to activate the Transport Organizer Web UI again. This video shows the above steps. This step refers to chapter 6 (‘Configure HCP as Application Type’) in the How-To guide. Now I will define an application type serving as a unique identifier for the SAP CP content I will transport via CTS+. This procedure is documented in a video. This step refers to chapter 7.1.1 (‘Configuring the Development system (Export system)’) in the How-To guide. Sources and targets for transports are identified in the CTS system by three letter acronyms (System ID or SID) which have to be unique within the transport domain managed by the CTS system. In our example I will use CAD (Cloud Account Development), CAT (Cloud Account Test) and CAP (Cloud Account Production). 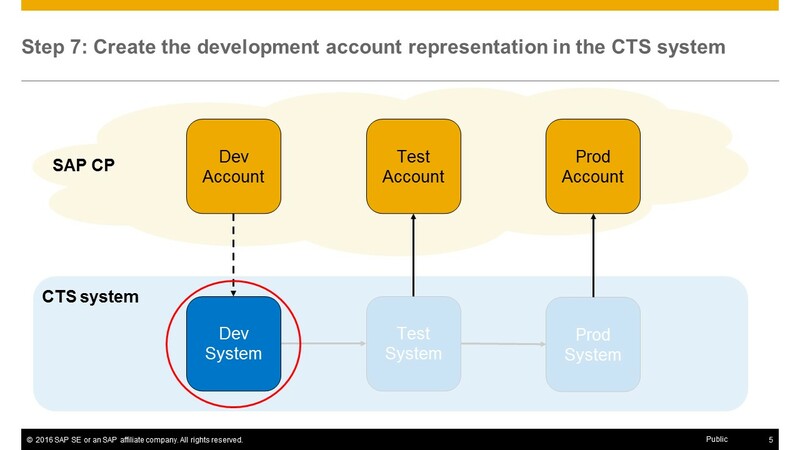 I will start with the system representing the SAP CP development account. Please also see the corresponding video. This step refers to chapter 7.1.2 (‘Configuring the Test and Production System (Import Systems)’) in the How-To guide. I will now setup the target systems for the transports, in my example the test and the production accounts. The creation of the test account representation is shown in this video. Repeat the above steps for your other target accounts, in omy example for the production account, this time using another SID, e.g. ‘CAP’ and the HTTP destination for the production account (in this example ‘CAP_DESTINATION’. Please also see this video. This step refers to chapter 7.1.3 (‘Transport Landscape: Defining Transport Routes’) in the How-To guide. I will now create the transport routes connecting the three systems / accounts I have setup in the previous steps. There are two types of transport routes: consolidation and delivery. The consolidation route is used for a connection where development artifacts are exported from one (development) system and imported into a consolidation (respectively test) system. The delivery routes are used for all subsequent connections in your landscape. When you import a transport into a system with an outgoing delivery route the transport is automatically added to the queue of the target system. In my example I will setup a consolidation route between the development and the test system and a delivery route between the test and the production system. The transport routes can be created using a graphical editor (described here) or by entering the required data into dialog windows. The above sequence is shown in this video. As an optional step I ran the ‘Check Transport Tool’ of CTS. I have now setup a typical three account / system landscape with a development, a test and a production environment. Does this also translate to other clouds, like Amazon Web Services? the examples shown in this blog are based on SAP Cloud Platform Neo, the proprietary platform hosted in SAP datacenters. However, some newer SAP Cloud Platform Services (like IoT) are based on Cloud Foundry which in turn will also run on AWS. The basic concept of Multi-Target-Applications (MTAs) also applies to Cloud Foundry, so that future expansion of the CTS+ integration of SAP CP services will also (indirectly) cover AWS (and potentially other IAAS providers hosting SAP CP on Cloud Foundry). To answer your question: currently no, in the future (indirectly) yes. Another topic would be if you run other CTS+ enabled solutions (e.g. SAP AS Java) on AWS servers. This would be available already today. I have read your blog and it is helpful. I want to know why backend system is used especially in chapter 5.1 where in if we have two cloud platform accounts. For suppose in my case, I have two seperate SAP CP Accounts which doesnt have any link. Now i want to transfer / transport my UI5 Appl and HANA Modelling pkg / schema from SAP CP Acc 1 to SAP CP Acc2. At this point of time as well, do i need to go to backend system and create a destination or is there any other way for Cloud to cloud transfer of data ? Of course you have the very basic option of exporting and importing your artifacts via your frontend. However this is very error-prone, cannot be automated and works differently for different services / run-times (if at all). For your example (UI5 and HANA content) it should work. 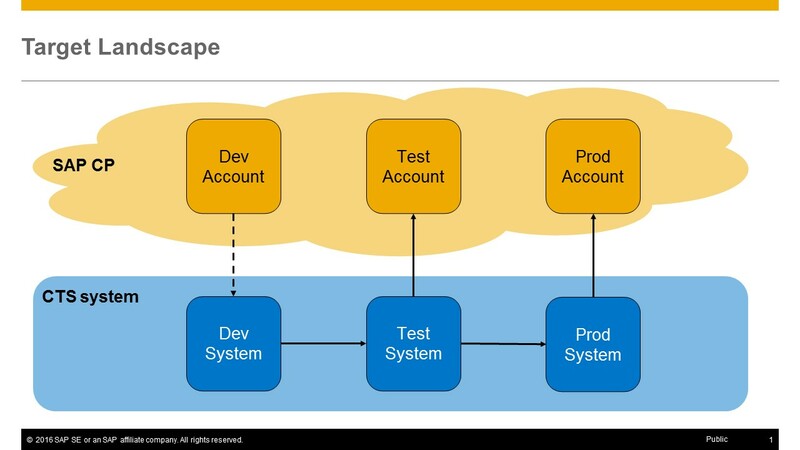 Another option would be setting up a continuous integration landscape as described in http://www.sap.com/developer/tutorials/ci-best-practices-intro.html. However, in this case you also need some kind of backend like a Jenkins server to automate building and deployment of your artifacts. Last not least we have begun to develop a native cloud based transport service which will enable moving artifacts between SAP CP accounts without a backend. Unfortunately we only just started the development and is too early to predict when it will be available. I hope to be able to show a lab preview at TechEd in Las Vegas or in Barcelona. Having said this, CTS+ with an ABAP backend system is currently the easiest option if you already have a fitting backend system. Thank you very much for sharing the knowledge. Very good article. Thank you for the detailed and interesting blog. Is it possible to use CTS+ to transport SAP SCI content? Can we Manage / transport iFlows and other artefacts created using SAP HCI / SAP SCI across Dev Test and Prod HCI/SCI Systems? I can tell you that much: our development is working on the topic and is quite far but it is still too early to specify a fixed release date. Currently the plan is to release this functionality in Q3/2017. I will update this blog, once the availability to customers is through. Thank you for the reply Harald. This MTA archive can then be attached to a CTS+ transport request. Do you already have an update if it is possible to use CTS+ for transporting SAP SCI content? And I try to follow your blog but I’m not sure about step 6 Configure SAP CP as application type. We have Solution Manager 7.2 with 7.4 sp-level 14 but when I try to add new entries I only can choose for application type BOLM, BPC, HDBLM, Microsoft~Sharepoint, Microsoft~SharepointAPP, SUP and XMII. I don’t see HCP as you told in your blog. What am I missing? Concerning your second question: if HCP is not yet present as application type in your system (as it you would expect when configuring it for the first time), you have to create it. Basically you do it by pressing the ‘New Entries’ button, as described in section 6. However, in the field ‘Application ID’ you cannot use the value help (which will only display some predefined entries) but manually enter ‘HCP’ in the field. This will force the creation of a new application type upon saving. 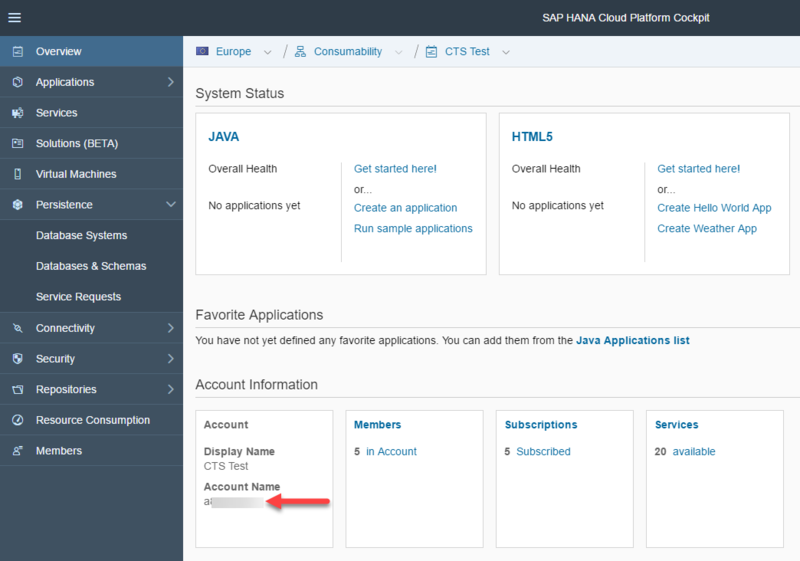 Thanks, we have enabled Solutions Lifecycle Management on our SAP Cloud Platform account but by reading SAP documentation we also have to create a new HTTP destination in Solutions Lifecycle Management. But how do we do this? What do we have to fill in? CTS+ is configured on our onpremise ABAP system but want to test it with the option to export SAP CP integration content as MTA. Do the accounts that are set up for the DEV, TEST and PRD environment represent separate instances of the HCP or do they represent a sort of “partitioning” within a single instance where each “partition” represents an area where a separate version of the content can be stored and executed? Your example contains a typical landscape design that would be found with an on premise type implementation. However, if a customer is implementing S/4HANA in the Public Cloud, there is only a Q and P system in the landscape. What would the landscape for the HCP look like when the HCP development is aligned with S/4HANA in the Cloud? I appreciate this overview, with this information I can understand many concepts about integration so I take the course of Cloud-Native Operations from openSAP. Very well, tank you for share. I’ve tried 80<sysno> (8004 for us – our DB system number is 04) as per the CTS for HANA guide (for a HTTP connection) but get the same NIECONN_REFUSED(-10) error. I’ve tried all sorts of number combinations, but believe I need to use the port number for a HTTPS connection in our case rather than HTTP – anyone know what this is? We connect in SAP HANA Studio to our system with 30415 and the XS port is 4304. I tried both these port numbers in the HTTP connection – and get a different message: “Connection is closed”. Not sure that’s any better! Which translates as “Error while testing destination <SID>_DESTINATION” – which doesn’t help a lot! Anyone know which port number we should be using? Thank you for writing this document, it is very helpful. I need to know the CTS+ configuration for hybrid solutions. 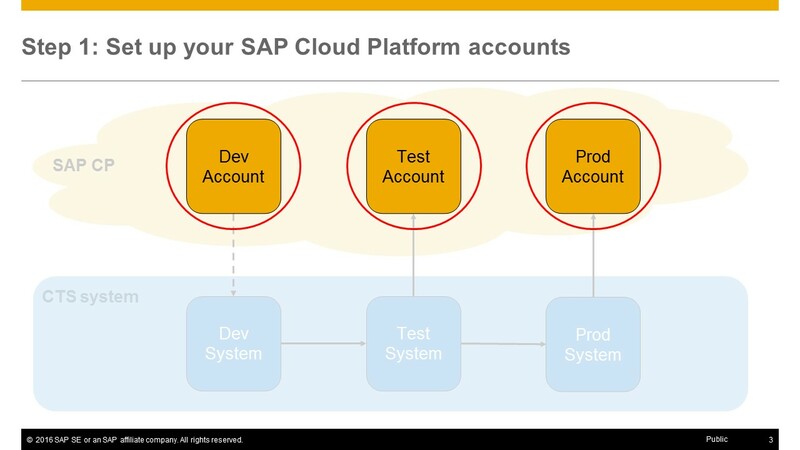 e.g Dev and Qua in SAP cloud platform and production “on premise”. can we use same setup for Dev and qua systems by creating http connections and normal rfc connection for production system. in principle it should be possible to create a hybrid queue including SAP Cloud Platform and on-premise targets, because you configure each target system individually. However, where I see challenges is the content attached to the transport request. For the scenario described above (transport multi-target applications between SAP Cloud Platform Neo environments) the import relies on the MTA deploy service, which is to my knowledge not available for on-premise environments (exception see below). SAP HANA XS classic running in SAP Cloud Platform Neo and on premise. Here the transports are based on SAP HANA delivery units, packaged as .tgz archives and for deploying them the same service is used in the cloud and on premise. SAP HANA XS advanced running in SAP Cloud Platform Cloud Foundry and on premise. Here the transports are based on MTAs on both sides and again the same service is used for deployment. However, there are different MTA versions for Cloud Foundry and SAP HANA XSA. So it would have to be checked if there are any incompatibilities. Maybe you could explain in little more detail which scenario you have in mind.